A Nobel Prize-winning discovery - that small double-stranded RNA molecules can silence genes by interrupting the translation of DNA's instructions into proteins - is finally delivering on its medical promise. The first drug that takes advantage of this natural biological process, called RNA interference, was approved August 10 by the U.S. Food and Drug Administration. It targets a rare hereditary disease that causes misshapen proteins to build up in patients' nerves, tissues and organs, causing loss of sensation, organ failure and even death. Heredity transthyretin amyloidosis, or ATTR, affects about 50,000 people worldwide. This drug will help the subset of those patients who have neurological impairments. Called patisiran, the drug uses specially designed pieces of RNA to silence a mutated gene that, when active in the liver, is responsible for patients' symptoms. In a recent 18-month clinical trial, patients who received patisiran injections every three weeks showed a slight decrease in neurological symptoms, whereas patients on the placebo worsened overall. It's not a cure - people still have the genetic mutation - but the treatment prevents the disease from progressing. This approval is "just the beginning," says Craig Mello of the University of Massachusetts Medical School in Worcester, who co-discovered the process of RNA interference in roundworms (SN: 10/7/06, p. 229). Many more drugs using the same approach, for diseases ranging from hemophilia to HIV, are winding through clinical trials. As a medical treatment, "what makes RNA interference so special is that it's biology, tested by 3 billion years of evolution," says UMass Medical School biologist Phillip Zamore, a cofounder of Alnylam Pharmaceuticals, the Cambridge, Mass-based company that makes patisiran. RNA interference is a normal cellular process: When a gene is turned on, the information that it contains is transcribed into single-stranded messenger RNA, or mRNA, which translates DNA's instructions into proteins. Small pieces of double-stranded RNA that don't carry protein-making instructions can target and bind to specific mRNA molecules and flag them for destruction, heading them off before they make proteins. In organisms ranging from plants to worms to humans, that process helps control when and where genes are active. 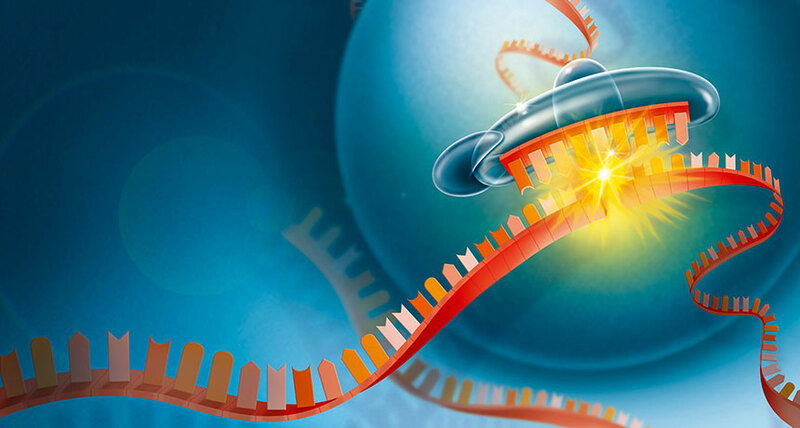 Patisiran and other RNA interference-based, or RNAi, therapies that are being developed use specially crafted snippets of synthetic RNA to artificially manipulate genes' activity. But translating the RNAi discovery into clinical applications has been challenging. "The thing about RNA interference that made it really attractive is the theoretical simplicity of it," says John Burnett, a biologist at City of Hope National Medical Center in Duarte, Calif., who has been working on using RNA interference to target HIV. "Of course, nothing is as simple as we anticipate." It took decades to figure out how to deliver such drugs to the right place in the body to reduce harmful off-target side effects, and how to design synthetic RNA molecules that don't degrade before they do their job Once there's a way to safely and effectively deliver a small piece of RNA to a specific organ, it's easy to switch up the RNA molecule to target a different gene in the same organ, Mello says. He predicts that a wave of similar RNAi-based drugs, especially ones like patisiran that target genes in the liver, will soon be available. "What an amazing process it's been to uncover the mysteries of these mechanisms that are shared by plants and yeasts and worms," he says. "To go from the basic biology to a drug in 20 years is kind of amazing."